Teenage girls will love this series with its intriguing, believable characters who face the same kinds of tough, real-life challenges they face as highschoolers today. From Waterbrook. About "I Only Binge on Holy Hungers (#03 in Raise The Flag Series)"
Since the beginning of the school year, Cheyenne has been meeting with a group of Chirstian classmates to pray. But even after all this time, she feels like an outsider. The other girls seem so together..., smart, nice clothes, good families. Cheyenne doesn't even have the money for a birthday present for Brianna. Then she makes a decision that causes things to go from bad to worse. Can God forgive her as bad as she is? Fiction for girls in junior or senior high school. Book number three in the "Raise the Flag" series. Dear Tobey, I'm in big trouble. Surprise, huh? I don't expect you guys to get me out of it, but maybe you could help me think of the right thing to do. Can we all meet at lunch? Cheyenne Since the beginning of the school year Cheyenne has been meeting with a group of Christian classmates to pray. But even after all this time, she feels like an outsider the other girls seem so together. They're smart; the have nice clothes they have good families. Cheyenne doesn't doesn't even have the money to buy Brianna a birthday present. If only she had the bucks to fit in! Thoughts like these only make Cheyenne feel like more of a loser. Then one day she makes a decision that cause things to like a bad situation to something much God forgive her...and actually love her, as bad as she is? The answer doesn't come easily, but in a powerful way it will change her life forever. An intriguingly diverse group of high school girls finds common ground in their faith as they face the challenges of standing up for what's right in the new girl's "friends" series, "Raise The Flag." 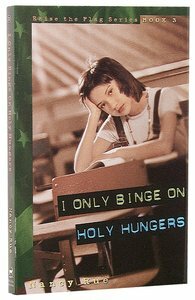 The first four books, Don't Count an Homecoming Queen, and "B" Is for Bad at Getting Into Harvard, I Only Binge on Holy Hungers, and Right Up There with Braces, set the tone for future "flagpole friends" titles.